Each family at Joey’s school participates in a “family share” once per year. The student is supposed to select what they want to share with their class…this could be anything from a Lego set to their favorite book/activity. 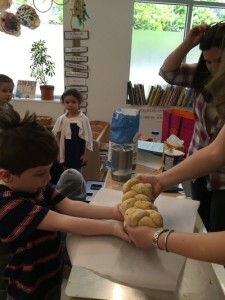 Joey knew exactly what he wanted months in advance… Aunt Lori to come in and teach his classmates about challah making. 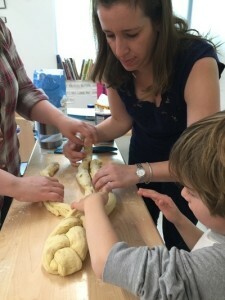 This is an activity he’s enjoyed weekly at his old school – and he’s certainly loves Aunt Lori’s homemade challah on Friday night. Due to all of the food restrictions (allergies), the kids werent able to taste any of it but they did have fun making it! This entry was posted in Joey, Preschool, The Panozzos. Bookmark the permalink.